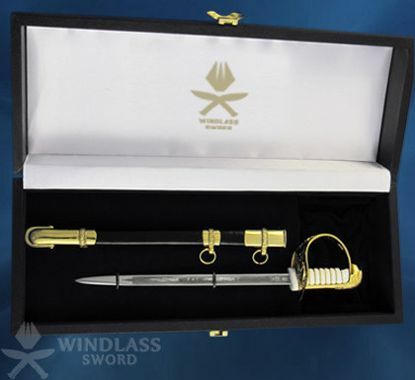 The high quality large miniature sword range includes Army, Royal Navy and Royal Air Force swords complete with their scabbards. 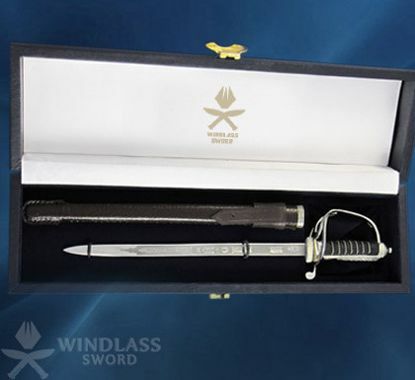 Supplied in a presentation case, these beautiful miniature replicas of the full size swords make an ideal gift or award within the defence industry and armed forces. The range of smaller, letter opener size, miniature swords make ideal promotional gifts or awards in both the commercial and military sectors. 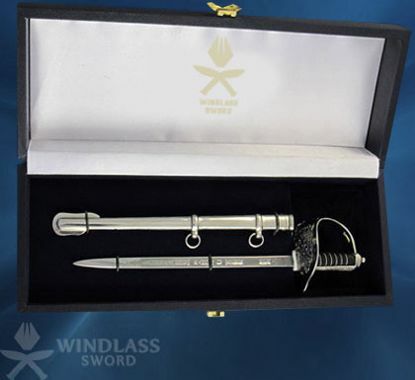 A beautiful miniature version of the famous RAF sword, this sword spells elegance and style along-with its age-old tradition of belonging to an elite class of weaponry. This RAF miniature comes in a presentation box which adds equally to the beauty of this model. Made originally in 1821, this pattern was initially used as a light-weight cavalry sword. It was much later adapted for use by the artillery. This efficient and easy to handle sword is renowned for its superb cutting blade. The scabbard which comes along with this sword is available in two types the nickel scabbard or if one prefers a more authentic look, the brown leather scabbard. This size of miniature is in fact called Large Miniature. This piece comes along-with an elegant presentation box. 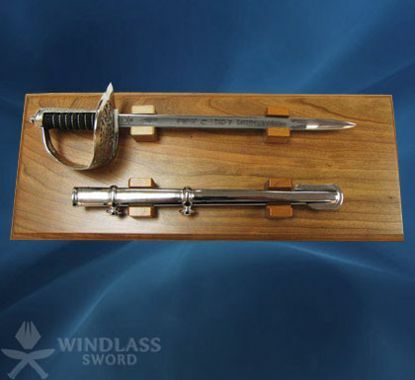 We supply a wide range of comprehensive designs of presentation stands for our many miniature swords. They come in different finishes and sizes. Featured here are a few of our selections from our range. Do feel free to get in touch with us in case there is something you require which is not shown here. 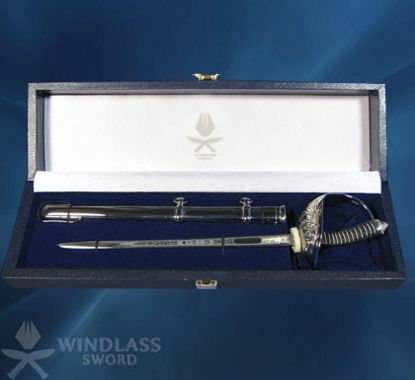 A beautiful miniature of the RAF sword, this piece comes with an elegant presentation box. The colour combination of black and gold gives it an old-world charm and adds to the elegance of this miniature. A replica of the traditional sword belonging to the Celtic era, this pattern goes back a long way. It belongs to the 5th century. Archaeologists have long since acknowledged that this sword is based on the Roman Spatha' design rather than the huge and heavy broadsword of legend. With an attractive colour combination this sword charms and enthrals everyone who will be enthralled with the stylish yet simple beauty of it. The straight carbon steel blade of this sword was in 1897 revised to make it double-edged for the final section of its length. An ornate regimental crest is finely etched onto it. 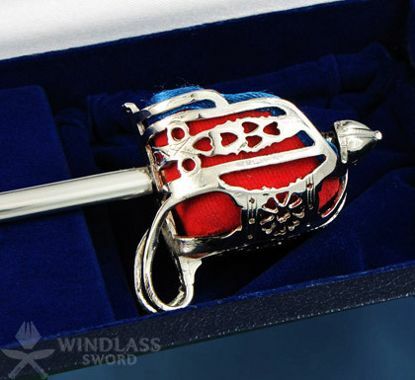 Made from exquisite nickel-plated steel, the guard of its three-quarter basket hilt is engraved with a scroll pattern which incorporates the royal cypher of the reigning sovereign. Silver-plated copper wire is carefully wound over the black fish-skin bound grip of the sword.The Infantry Officers' sword could be borne in a Sam Browne leather scabbard with plated brass mouthpiece for service wear, or in a fine nickel-plated steel scabbard for the purpose of a full dress occasion. This Infantry Large Miniature is available with a nickel or brown leather scabbard. An exact replica in miniature, this sword is in fact a perfect copy of the sword which is currently worn by Officers of the Infantry and other Corps, including the Royal Marines and the Senior Warrant Officers. This design has an ancient past which can be traced back to 1895 when the change in the technique of sword-fighting demanded a thrusting blade instead of the cut and thrust blade of the previous Victorian Officer's swords. In 1897, the pattern of this miniature was altered a bit. The inside of the guard was turned down to prevent chafing the uniform coat. The guard bears the crest of the reigning monarch and also includes various scroll designs. The popularity of this design is spread far and wide. This sword is carried by Officers of Commonwealth countries and also by independent countries who were previously under the British rule. The Cavalry Officers sword sports a finely crafted carbon steel blade which is also decoratively and artistically etched. The guard features a suave and subtle honeysuckle design which is intricately engraved into its nickel-plated guard. Both Sam Browne and nickel-plated scabbards are available along with this miniature sword. This sword has had a long history in the making. The first such Royal Navy pattern sword was commissioned as early as 1805. Later, its elegant but impractical design of having a superseded solid-hilt design was developed in 1827. The blade was standardised for all Royal Navy Officers in 1846 which then paved the way for the current light-weight, single-edged straight blade, which was adopted in 1929. 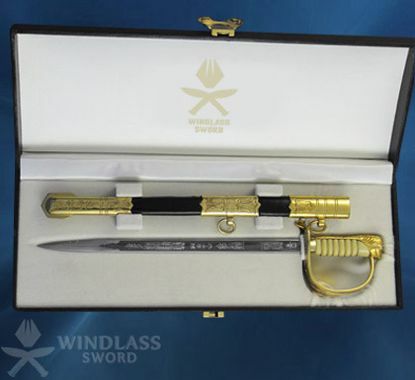 The sheath is interlaced with an ivory black and plated-gold design. 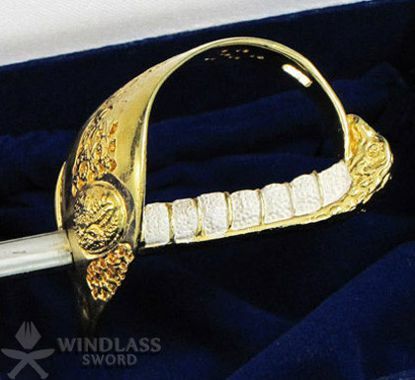 The fine blade of this sword is intricately etched with delicate engravings.